· Hosts from the 2001:DB8:CAFÉ::/64 network do not have HTTP access to the other networks. · Hosts from the 2001:DB8:CAFÉ:1::/64 network are prevented from access to the FTP service on Server2. · Hosts from the 2001:DB8:CAFE:1::/64 and 2001:DB8:CAFE:2::/64 networks are prevented from accessing R1 via SSH. Note: To access R1 and the FTP servers, use the username user01 and password user01pass. Hosts from the 2001:DB8:CAFE::/64 network are intentionally unable to access the HTTP service, but should not be otherwise restricted. a. Using L0, L1, and L2, attempt to access HTTP services of Server1 and Server2. b. Using L0, ping Server1 and Server2. c. Using PC0, access the HTTPS services of Server1 and Server2. d. View the running configuration on R1. Examine access list G0-ACCESS and its placement on the interfaces. Is the access list placed on the correct interface and in the correct direction? Is there any statement in the list that permits or denies traffic to other networks? Are the statements in the correct order? e. Run other tests as necessary. Make adjustments to access lists to fix the problem. No traffic is getting through because of the implicit deny any. Added a permit ipv6 any any to the G0-ACCESS. Hosts from the 2001:DB8:CAFE:1::/64 network are prevented from accessing the FTP service of Server2, but no other restriction should be in place. a. Using L0, L1, and L2, attempt to access FTP service of Server2. b. View the running configuration on R1. 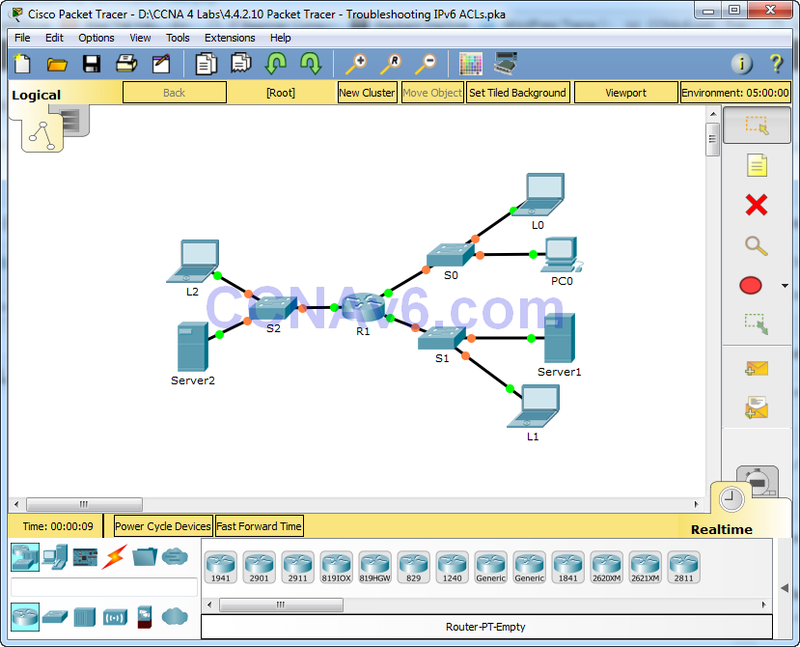 Examine access list G1-ACCESS and its placement on the interfaces. Is the access list placed on the correct port in the correct direction? Is there any statement in the list that permits or denies traffic to other networks? Are the statements in the correct order? c. Run other tests as necessary. G1-ACCESS was applied outbound on G0/1. Removed as outbound and applied as inbound on G0/1. Only the hosts from 2001:DB8:CAFE::/64 network are permitted remote access to R1 via SSH. a. From L0 or PC0, verify SSH access to R1. b. Using L1 and L2, attempt to access R1 via SSH. c. View the running configuration on R1. Examine access lists and their placements on the interfaces. Is the access list placed on the correct interface and in the correct direction? Is there any statement in the list that permits or denies traffic to other networks? Are the statements in the correct order? d. Perform other tests, as necessary.